While we all felt fairly certain about what the main features of the service would be, it became obvious fairly quickly that there was something we were missing. 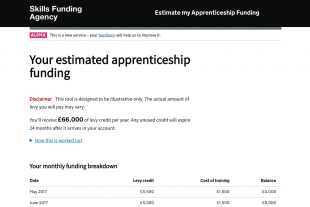 Employers wanted a way to estimate how much the new funding model would allow them to spend on apprenticeships. They wanted a way to calculate quickly what different types of apprenticeships would cost them and how that cost looks over time. It took a while for the penny to drop but we finally realised we should stop what we were building and push this to the top of the list of priorities. Our developers sat with our policy experts and coded together a little calculator, as a simple way for employers to estimate what the funding policy meant for their payroll. We built a quick version then tested it with employers. They gave us the thumbs up and we built it using the Government Digital Service (GDS) smart answers template, which is used by numerous government websites. Here’s a description of how the smart answers template works. Because the code has already been written and shared, it makes building the thing really quick. It took our developer less than a week. After a few more rounds of testing, we put the calculator online and invited employers to try it for themselves. We called it Estimate my apprenticeship funding. So far, it’s had great feedback. It's been used over 20,000 times in just 3 months. Employers tell us they are able to start planning their apprenticeship programme now, before the rest of the functionality goes live at the start of next year. For us, it was a good lesson in recognising that users set the priorities for delivering digital services. It takes courage to change the order of delivery part way through the process but listening to users pays off every time. Thanks to everyone who worked to push this to the top of the list. This is the second in our series of posts on the digital apprenticeship service, tracking delivery from private beta through to live. To make sure you don’t miss an update, sign up for email alerts or subscribe to our RSS feed. For more details on the new apprenticeship funding model, see how the apprenticeship levy will work.